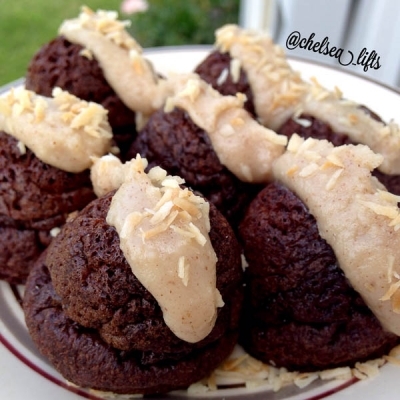 Protein packed root beer flavored chocolate cake bites topped with delicious coconut butter icing and unsweetened coconut flakes. Turn oven on to 350F and let it pre-heat. In a medium sized bowl, Mix all ingredients together except for the Coconutter Sweet Spreads Icing and the Unsweetened Coconut Flakes. Spray cake bite silicon pan with non-stick spray and fill each one about 2/3 of the way with your cake batter. Cook in oven for about 15 minutes, or until cake bites are cooked all the way through. Take out of the oven and let cool before drizzling with Coconutter SweetSpreads Icing and topping with some sprinkled Coconut Flakes.